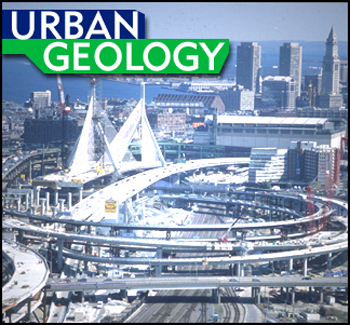 The Big Dig, more than 14 years in planning and $14 billion in cost, is just a snapshot of a long history in a city that is an ideal laboratory for geological engineering. The U.S. Geological Survey is populating the United States with networks of seismic monitors as part of a new approach to earthquake mitigation: Warning instead of prediction. Snapshots of urban hazards: earthquakes in Kobe, subsidence in Las Vegas, lava in Goma, landslides in Colorado Springs. Energy Notes: Read this month's energy notes and link to a new archive of past energy numbers! Students: Read our special careers page. All the usual geological processes have been joined by a new and immensely significant one never before seen on the planet, and one without which civilization would not exist: agriculture. We need to break the cycle of administration-requested budget cuts if the U.S. Geological Survey is to prosper. Few realize how many fires burn from the worlds coal mines, or the dangers those fires pose. The Leonard P. Zakin Bunker Hill Bridge, with the Storrow Drive Connector Bridge running alongside it. Paul Revere Park is on the left. Photo courtesy of CA/T Project, Boston.